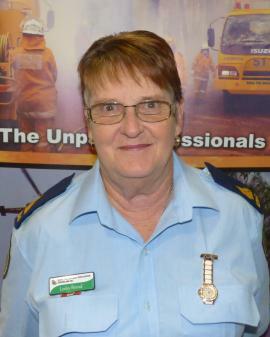 Lesley is the current secretary of Brooweena District RFB, a position she has held for 28 years. She has also been the Deputy Fire Warden for Brooweena and Innooroolabar for 5 years, a VCE for Brooweena District Rural Fire for 10 years, and the inaugural Group Administration Officer for Maryborough and District Rural Fire Brigade Group (a position she held for many years). She has been an active firefighter and working in her Brigade's incident room. Lesley has an extensive knowledge of the operations and functions of brigades, and has been actively involved in the welfare of brigade members (something she is very passionate about).